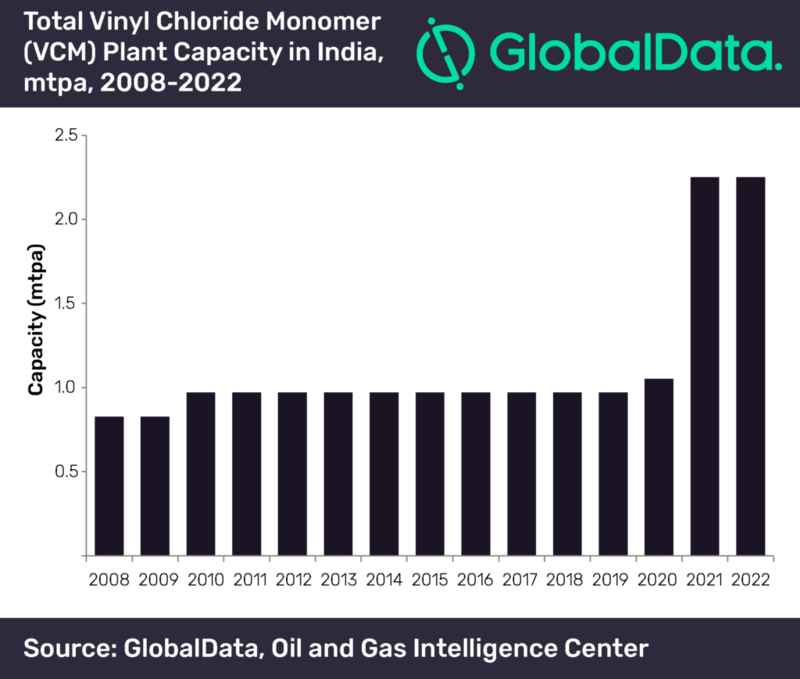 India’s Vinyl Chloride Monomer (VCM) plant capacity is forecasted to grow at a compound annual growth rate (CAGR) of 18.3% from 0.970 million tonnes per annum (mtpa) in 2017 to 2.252 mtpa in 2022, according to GlobalData, a leading data and analytics company. The company’s report: ‘Vinyl Chloride Monomer (VCM) Industry Outlook in India to 2022 – Market Size, Company Share, Price Trends, Capacity Forecasts of All Active and Planned Plants’ reveals that three upcoming projects, Reliance Industries Dahej Vinyl Chloride Monomer (VCM) Plant 2, Reliance Industries Dahej Vinyl Chloride Monomer (VCM) Plant 1 and Reliance Industries Vadodara Vinyl Chloride Monomer (VCM) Plant with a capacity of 1.200 mtpa, 0.046 mtpa and 0.036 mtpa, respectively are expected to commence their production by 2022. The largest VCM plants in India in 2017 were Reliance Industries Dahej Vinyl Chloride Monomer (VCM) Plant 1, Reliance Industries Hazira Vinyl Chloride Monomer (VCM) Plant, Finolex Industries Ratnagiri Vinyl Chloride Monomer (VCM) Plant 1, Finolex Industries Ratnagiri Vinyl Chloride Monomer (VCM) Plant 2 and Chemplast Sanmar Mettur Vinyl Chloride Monomer (VCM) Plant. The main sector that consumes VCM in India is Polyvinyl Chloride (PVC). In 2017, this sector accounted for almost 97.7% of the VCM demand in the country.